Democrats controlled the White House and/or both Houses of Congress during 18 of the 20 sessions of Congress from 1945 to 1981. Republicans controlled the White House and/or both House of Congress for 13 of the 14 sessions of Congress from 1981 to 2009. 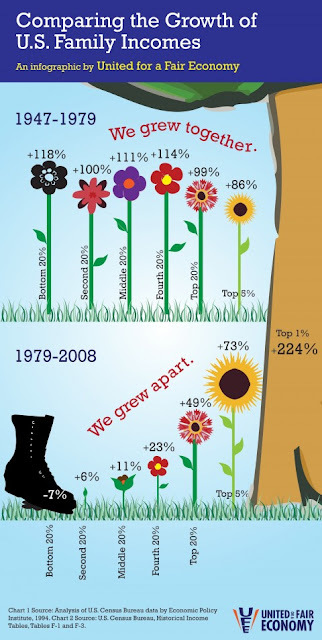 The infographic below from United for a Fair Economy pretty much tells the story. From 1947 to 1979 when Democrats were in charge, all segments of society saw income growth. From 1979 to 2008 when Republicans ruled, income growth was concentrated primarily in the upper income levels, particular among the top 1% who experienced income growth of 224%. The bottom 20% of wage earners actually saw their income fall by 7% under Republicans during the 1979 to 2008 period.